Everyone can get involved! Do you want to play? Coach? Officiate? Volunteer? See how you can get involved today! 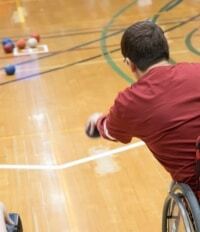 Want to become a boccia athlete? If you are looking for a fun, dynamic and inclusive sport… look no further. 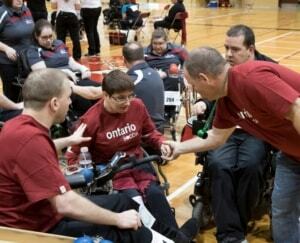 There are many boccia athletes across Ontario with local clubs appearing in many different cities. See here for a local club near you! Don’t see a club in your city? Why not start one yourself?! Contact info@ocpsa.com to see if there are other athletes in your area and how you can start your own club! Are you interested in becoming an official? There are five different pathways you can participate in and all are crucial to providing the opportunity for athletes with the opportunity to test their skills. Without officials, the game can’t go on! LINESPERSON: Assists the referee on court during the game, particularly when calling violations. Basic knowledge of boccia needed- no experience necessary. TIME-KEEPER: Operates the timing and scoring system during the game. No experience necessary. REFEREE: Manages the game during a competition and makes decisions according to the rules. Must attend a weekend referee course to become certified. HEAD REFEREE: Oversees all referees during a competition. Prepares the referee schedule and deals with any rule issues. Works with the Technical Delegate to ensure all aspects of the competition run smoothly. Must be a referee and appointed by the tournament coordinator. TECHNICAL DELEGATE: Oversees the competition structure, including setting up athlete pools and game schedule. Works with the Head Referee to ensure all aspects of the competition run smoothly. Must have extensive knowledge of the game and experience. Does this sound like something you want to be involved in? Contact OCPSA (info@ocpsa.com) to see when the next course or tournament is! 1. Community Coach: Coaches have a basic understanding of the game and can lead recreational boccia sessions. Usually community coaches are parents, recreation leaders, staff of residential homes, or teachers. 2. Competition Coach: Coaches are focused on identifying gaps and preparing athletes for competitions that can range from community to international. Coaches are preparing training programs and analysing the athlete to bring them to their fullest potential. There is flexibility for the coach to choose which stream or level they would prefer to coach and with which athletes. For additional coach training sessions, see Coaching Association of Ontario or Coaching Association of Canada. 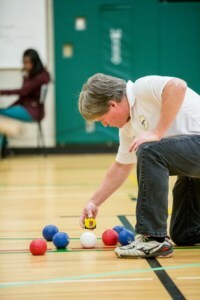 Are you interested in becoming a boccia classifier? Classifiers are very important for boccia as they determine which class an athlete is eligible to compete in at their first competition. All classifiers complete the same training, but there are two types that require professional backgrounds.